The MCP9701 can accurately measure temperature from -10°C to +125°C. The output of the MCP9701 is calibrated to a slope of 19.53 mV/°C and has a DC offset of 400 mV. The offset allows reading negative temperatures without the need for a negative supply. The Raspberry Pi 3 Model B features a quad-core 64-bit ARM Cortex A53 clocked at 1.2 GHz. This puts .. This limit switch module when activated makes the ‘NO’ pin to HIGH and ‘NC’ pin to LOW and also the .. The Atmega32 Microcontroller is high-performance, low-power Atmel 8-bit AVR RISC-based microcontrol.. Specifications Wire Type: 5 Pin ..
Specification · Colour: Black · &.. 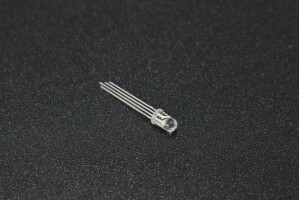 It provides clock pulses of 3.579 MHz frequency. Because these are very common and inexpensive the.. The DS1307 serial real-time clock (RTC) is a low- power, full binary-coded decimal (BCD) clock/cal..